John Thomas Taylor's name is inscribed on the Preston Plucknett War Memorial. However, his connection with Preston Plucknett and/or Yeovil is completely unclear - in fact I can find no evidence of his connection at all. John Thomas Taylor, known as Tom, was born on 6 January 1884 at Gillingham, Dorset, one of the five children of John Tom Taylor (1856-1916) and Hannah née Cross (1857-1929). In the 1891 census the family were living in Gillingham but by 1901 they had moved to Abertillery, Monmouthshire, Wales. On 10 July 1905 Tom enlisted in the Royal Navy and was based at HMS Vivid II. He was a stoker and his Service Number was 308593 (Dev) - that is Devenport. HMS Vivid II was the name of the Royal Naval barracks at Devonport. Tom served aboard a number of different ships including Duke of Edinburgh (19 February 1906 to 9 March 1908), Leviathan (30 March 1908 to 15 May 1911), Indus (17 June 1911 to 6 October 1911), Royal Arthur (2 November 1911 to 22 December 1911), Kent (23 December 1911 to 19 August 1913), Leander (12 January 1914 to 13 November 1914), St George (14 November 1914 to 3 September 1915). The intervening periods were spent at Vivid II. By September 1915 Tom was a Leading Stoker. From 4 September 1915 onwards he was based at Vivid II. However, it appears that Tom became ill and from 5 November 1915 he was confined to the Royal Naval Hospital at Great Yarmouth, suffering from "general paralysis" and classed as a "dangerous lunatic". 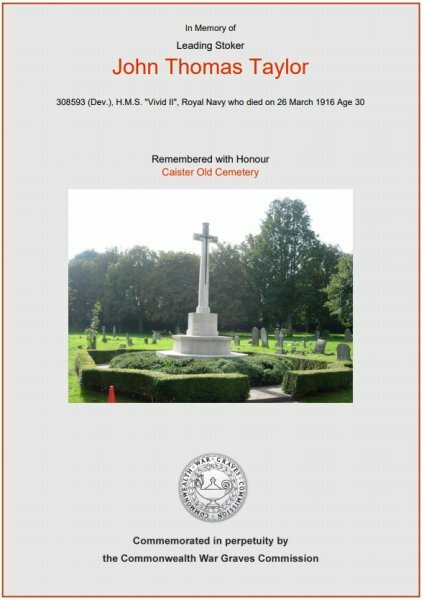 He died in the hospital on 26 March 1916 and was interred in Great Yarmouth (Caister) Cemetery, Grave B.137. Tom was aged 30. His name is inscribed in the County of Somerset Book of Remembrance in St Martin's Chapel, Wells Cathedral and is also inscribed on the Preston Plucknett War Memorial. The Commonwealth War Graves Commission certificate in memory of John Taylor.